SAN DIEGO (NEWS 8) — San Diego is no stranger to epic rock and pop concerts. Over the years some of the biggest names in music have made their way through America’s Finest City. While we continue to host legendary acts – Paul McCartney next summer anyone? - it’s fun to look back at who has graced our local stages in decades past. Rock along with these clips from the News 8 archives from the 1970s, ‘80s and ‘90s. Admission is free! On April 9, 1979, rock-and-roll showman Alice Cooper, along with The Ultra Latex Band, took to the stage at what was then the San Diego Sports Arena. The concert was part of Cooper's Madhouse Rock Tour. The performance was recorded and released in September of that year as a live concert video called "The Strange Case of Alice Cooper" - which can still be found today. News 8's Janet Zappala reported on the show which, featured a 40-foot break-away TV screen, a 9-foot cyclops and dancing nuns. Cooper opened the show with "From the Inside" from the album of the same name. In the summer of 1979, Rod Stewart was in the final days of his Blondes 'Ave More Fun Tour when he appeared in San Diego to rock the Sports Arena. This concert footage from the News 8 archives features Stewart and his band performing "Hot Legs" and "Born Loose." In early 1981, The Beach Boys played the Sports Arena in San Diego. News 8's Larry Himmel reported that the group was celebrating 20 years together. The piece features snippets of several Beach Boys classics including "California Girls," "Sloop John B," and "In My Room." On her very first tour, Madonna came to San Diego and played two concerts at SDSU Open Air Theatre. "The Virgin Tour" promoted the singer's first two albums, one self-titled and the other Like a Virgin. 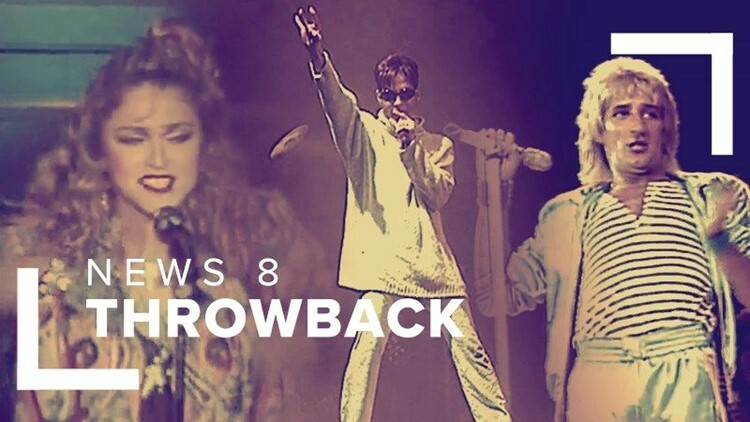 This News 8 piece from the archives opens with Madonna's hit "Holiday." The clip also features many material girls dressed in iconic 1980s Madonna fashion. In the summer of 1988, REO Speedwagon came to San Diego and played at the Del Mar Fair. News 8's archive footage of the concert features the rockers performing "Don't Let Him Go." The illustrious Prince came to San Diego several times throughout his prolific career. In 1997, as part of the Love 4 One Another Charities Tour, "The Purple One" played RIMAC Arena, although at that time he was going by an unpronounceable symbol, also known as the "Love Symbol." This News 8 archival footage features the singer and his band pumping out "Jam of the Year" from his 1996 album "Emancipation."